There are three certainties heading into Sunday night's Super Bowl. A Harbaugh brother will win. A Harbaugh brother will lose. A lot of people will be tuning in just for the commercials. Yes, the ads have become a big part of the country's most-watched event of the year. CBS is reportedly collecting a record $3.7 million to $3.8 million for every 30-second slot during the NFL championship game. Most of the advertisers are gargantuan food, beverage, and car companies. There is little that they can accomplish in a brief clip of airtime that will excite investors. However, there are more than a few small and medium-size publicly traded companies that will be in the mix this year. Let's go over four in particular that investors may want to keep an eye on. RIM shares are tanking after the BlackBerry 10 unveiling, and predictably so. However, now many consumers will get their first glimpse at the fading smartphone maker's new devices and the bar-raising features of its new mobile operating system. This could very well be RIM's last chance to matter, and the ad will have to wow consumers now that the presentation didn't wow investors. 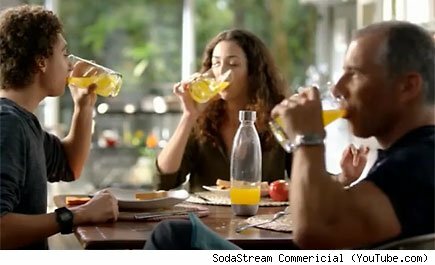 CBS rejected SodaStream's original ad, which reportedly poked fun at the old cola war ads starring Pepsi and Coke truck drivers. Plan B for SodaStream is a tweaked version of its recent "SodaStream Effect" spot, in which exploding bottles illustrate the eco-friendly nature of making fresh soda at home. SodaStream's coming off what should have been a monster holiday quarter, but we'll know when it reports next month. The Wall Street Journal reports that this Canadian T-shirt maker spent just $1 million advertising in the United States last year. It's going to spend that several times over on Sunday night with its first Super Bowl spot. The consumer electronics giant has snapped up Super Bowl ads before, but this time the superstore chain has a new CEO and a desperate need to regain its relevance. Hopefully it won't spend its costly 30 seconds marketing another add-on service that shoppers clearly don't want. The Motley Fool's chief investment officer has selected his No. 1 stock for the next year. Find out which stock it is in our brand-new free report: "The Motley Fool's Top Stock for 2013." I invite you to take a copy, free for a limited time. Just click here to access the report and find out the name of this under-the-radar company. The article 4 Stocks Betting on Super Bowl Sunday originally appeared on Fool.com. Longtime Fool contributor Rick Aristotle Munarriz owns shares of SodaStream. The Motley Fool recommends SodaStream. The Motley Fool owns shares of SodaStream. Try any of our Foolish newsletter services free for 30 days. We Fools may not all hold the same opinions, but we all believe that considering a diverse range of insights makes us better investors. The Motley Fool has a disclosure policy.